Waterfowl hunting requires quick reflexes, and the Federal Speed-Shok 2 ¾ #4 birdshot will give you that decisive edge on any hunt. 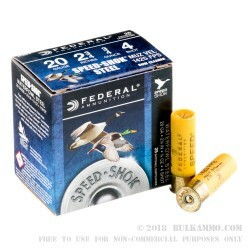 Federal Speed-Shok 2-¾ #4 birdshot is manufactured using steel shot, which is three times harder than your standard lead shot pellets. 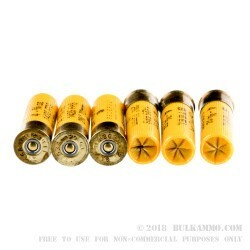 While lead shot is compressed three times upon ignition of the primer: once against the wad, again through the forcing cone, and lastly through the choke, steel steel shot does not deform due to the metals inherent hardness. Resulting in a tighter, more accurate shot pattern during your hunt. 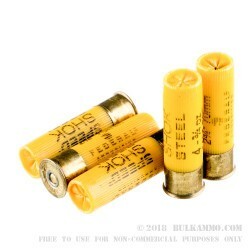 The #4 shotshell has an exceptional velocity of 1,425 feet per second, and is capable of effectively engaging waterfowl out to distances of 25 yards. 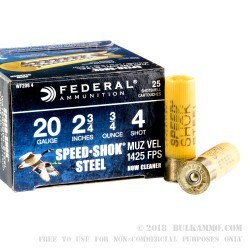 The distinct yellow hull of Federal’s Speed-Shok 2-¾ #4 shotshell prevents you from confusing the ammunition with similar shotshells of different calibers, and at a price the whole family can enjoy, the Federal Speed-Shok 2-¾ #4 shotshell is guaranteed to be one one of your favorite ammunitions.